The SkiBike Shop: SkiBike Season 2015 - Wayne's Damp Squib? 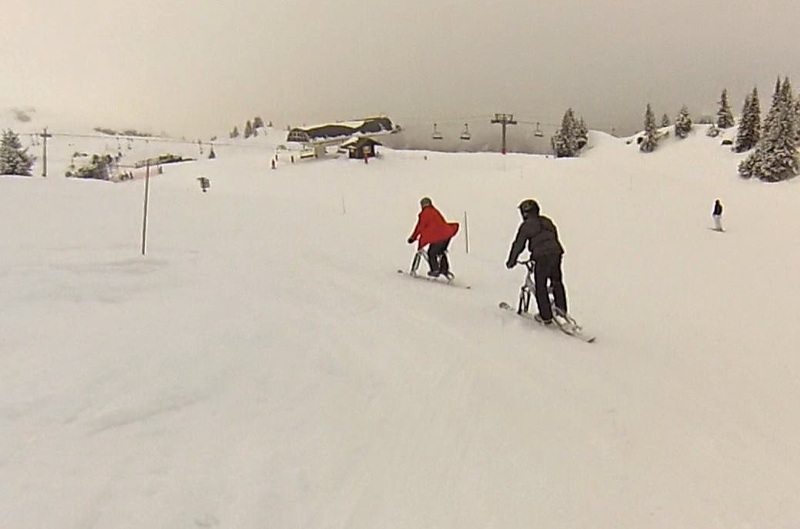 SkiBike Season 2015 - Wayne's Damp Squib? So what has been the result of 2015 in regards ski biking for yours truly. Sort of an odd year in some ways and not what I had really intended. I have skied more than ski biked this year and that has been a bitter pill in some ways, as I do enjoy the biking on snow. Mind you the conditions I have skied in this year, which generally have been really slushy and poor, I haven’t missed much, it’s not been an epic snow season for sure. On the technical side I haven’t really moved forwards, as the intended bravado of publishing a method to make ski bikes from composites, turned out to be a bit of a dud, purely because the bike frame turned out too heavy. The one I built using a surfboard type method, weighed in at 10 kilos fully inclusive of skis v the semi moulded one at about 7 kg. If you simply convert a quality downhill mountain bike with good components, you are going to be around that weight and save yourself a load of build time. The first build method I used of using a sacrificial MDF mould, CNC cut, I think will sort the over weight problems out nicely. This summer I’ll try and get ahead of the game and finish this project off. Apologies to anyone who had read and was following that earlier article on ski bike build, I just need to go back to where I was originally and build out from there. Secondly, I wanted to try my idea of a front ski adaptor, but due to the lack of skibike time on the snow owing to work commitments and mainly due to the nature of the groups I travelled with ( all skiers and snow boarders ) taking only a skibike to resorts, which were known to be limited to certain pistes, or may never have seen a ski bike before, without any plan B was always going to be risky. Again, over the summer I may build one or two prototypes and ride them locally. With the days I have ski biked, have I learned anything? Yes in lots of ways. Why do ski bike manufacturers insist on having such long forks, long suspension travel and by consequence such a high peg height. You see these bikes around and the riders look like Giraffes on the Serengeti. Get that centre of gravity down guys and girls and restrict the amount of travel. For me that was highlighted riding a hard tail SnoScoot for the day. I've always run low peg heights instinctively and once you ride a bike with very low COG you will understand what I mean. The SnowScoot takes this to the extreme with your boots virtually at ground level. The feeling of being down on the snow really does feel much more akin to actual skiing, throw in the bike aspect and you really do get that true ski biking / skiing cross over. Many will say that with a low peg height, the inside peg will hit the snow, but in all honestly I have yet to get problems, even on very steep hard pisted conditions, nor will being so low in powder be a problem, with the very low frontal area of the Scoot, probably being the easiest bike I have ridden in powder. Talking of pegs, I rode a bike with pegs that simply bolted into where the crank goes. They are also quite small in surface area. For the first time I had sore balls of my feet, painful ankles and worse still, my ageing hips were starting to really feel hard done by after a single day. As the rider of this bike sits most of the time, it hadn't been a problem before but I stand all of the time, it really did highlight the importance of measuring what the distance between your feet are when you naturally stand and opening the peg width to suit. I tried skis with the side cut spread across the front and back ski i.e. each ski starts wide and ends narrow, with the rear ski turned 180 degrees to form a constant arc across the two skis, this year for the first time. As much as I found them interesting, they have an inherent problem. At speed they work fine and will carve well on their edges as per a conventional ski. As soon as the front ski begins to take a different line, as in when you want to scrub speed off by allowing the rear to slide out sideways, then a whole new geometry problem arises. Most obvious was when you wanted to “hockey stop” to a halt, as you kicked out the back end and lent the bike into the slow speed corner, the geometry arrangement actually makes the ski edge bite in even at more of an angle, the last thing you want. It really did perplex me to start with and once I learnt to keep the bike much more upright, to the point of actually almost slanting the bike down the hill, I could break the ski off its edge, but for a novice that is not very intuitive as under G force the bike naturally leans in, simply compounding the problem. In comparison to a normal ski, you have to ask whether the high speed advantages are worth the slow speed disadvantages. Shared sidecut skis - are the high speed advantages are worth it? Skibiking with three others who I hadn't skibiked with for a year and noting how their sytles have changed highlighted something to me, watching the film I had taken reinforced that. 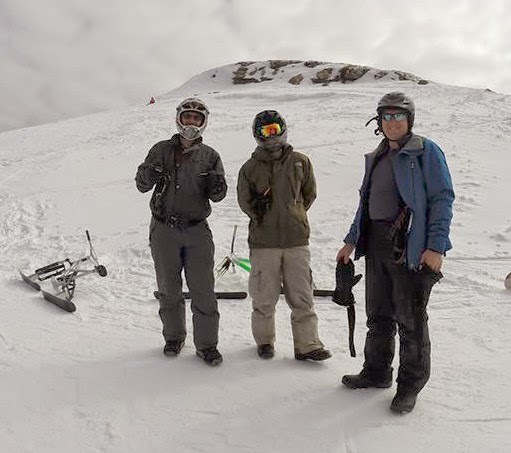 All four of us are self-taught, without really discussing method and generally have evolved a method to get down the mountain safely and in control. We are all now very competent and as good as most. What we have all done is end up with a very similar style of riding though, yes some sit, some stand but we all ride with that very “waggly” rear ski controlling our speed and the front maintaining the direction. Some will criticise that we are not carving enough, but if you think this method through and compare it to normal skiing, you have to ask just actually how much do you carve with skis. Yes in nice open terrain, say nice blues and easy reds, you do carve on skis but then ski bikes do take nice open turns, using the edges to carve on similar terrain. On steep black runs or tight tracks between pistes, where you short swing down the fall line, in skiing you actually are encouraged to compress your legs slightly to encourage side slip, controlling speed, use a leg extension to edge check and build a platform, to then compress the legs ( unweighting ) rotate the skis back up the fall line and across to the new direction, again side slipping to control speed. Surely with the evolving method that the four of us are using, are we not doing the same. The front ski controls our heading whilst the rear ski goes from side to side controlling speed, the rider compresses / lowering their body to allow the side slip just as a skier would, now extend out the legs to effectively load the ski edge ( platform ) and then pull the legs in to allow the bike to rotate back up the hill, once past the fall line allow the bike to side slip and start to extend the legs slightly, using the side slip to control the speed. As Skibikers we need to also use the front ski to maintain direction and I'm tending to find that on very steep slopes the handle bars are nearly always in the same plane as my shoulders, i.e. if I'm facing say 10 o'clock to the fall line then my front ski is pointing much the same. That again is a skiing basic, your shoulders should always face down the fall line. Interesting stuff, perhaps I should write an illustrated book. Lol! So another ski season on bikes and I think probably the first true season where we virtually can go anywhere in the ski world and ski bike, give yourselves a big pat on the back all those who have been at the forefront with seeking permissions from ski resorts and a further big pat on the back to all those participants who are now actively “ Ski Biking”.